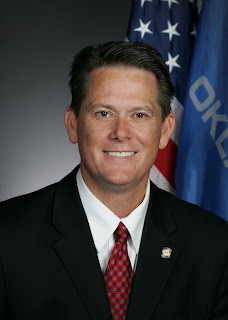 State Rep. George Faught (R-Muskogee) received the top 'Limited Government' rating from Oklahomans for Sovereignty and Free Enterprise (OK-SAFE) for votes bills that made 3rd Reading this session. A bill that actually passes on 3rd Reading is sent to the next chamber (from House to Senate, or Senate to House). OK-SAFE took ten bills, and rated them. "The general guidelines for supporting a bill were that it promotes constitutionally-limited government, or was a preemptive bill against more federal intrusion or initiatives. The general guidelines for opposing a bill were that the bill increased the power, scope and reach of government beyond it's proper function or boundaries, and/or increased the use of technology as enforcer (i.e surveillance)." Faught was one of five representatives to get the top score: 9 out of 10 votes. The other legislators were Charles Key (R-OKC), Jason Murphey (R-Guthrie), Mike Ritze (R-Broken Arrow), and Paul Wesselhoft (R-Moore). You can view the scores for the entire state house by clicking here. Go here to find out more about OK-SAFE.